‘Rafael’ was one of the greatest Armenian circus performers of the century. December is always a bittersweet month for the world of the circus. While most artists know it as a time for festive holiday performances for millions of families and children around the globe, it is also a time to say a quiet goodbye to the great artists we lost in the past year. Mamikon Akopyan, whose stage name was "Rafael" but who went by "Rafik," was a clown and master equilibrist known for his funny and often dangerous acts, as well as the unbelievably long time he spent in the ring. He stopped performing only when he was 76 years old. 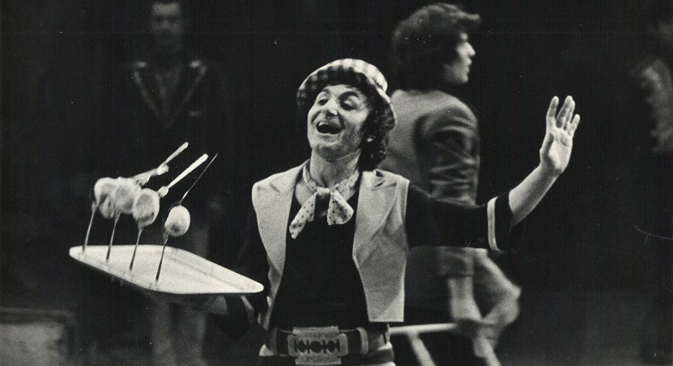 Alongside the clown Leonid Yengibarov, he was one of the greatest Armenian circus performers of the century. I have seen hundreds, maybe even thousands of artists over the 25 years I’ve been watching performers and I was even fortunate enough to watch Russia’s most famous clown Yury Nikulin deliver a few jokes live in the ring once. Rafael is one performer that I was never fortunate enough to see on stage, and I know I missed out on a lot. Watching YouTube videos of his work just isn’t the same. He was one of those circus artists who didn’t just perform in the ring for 20 years then retire, but was one who lived and breathed the circus life, loving every minute on stage and backstage. Even while leaving Florida, where he went to celebrate his 80th birthday with his family, you would never know that he had landed in the hospital during his trip. At the airport he was smiling, laughing, waving, giving his last performance from a wheelchair. My favorite act of his was the "Two Happy Indians and One Palm Tree." I just love this act, because it has the rare combination of acrobatics, humor and miming. Most clowns tend to do their acts on the ground. But his dancing music and choreography, plus the running up a long pole held on the shoulder of his partner, brings a uniqueness to the Soviet circus. While I was not lucky enough to meet him, I was able to meet his family, his daughter Anaida, son in-law Gagik, and granddaughters Tatevik and Arevik. From their talent and their kindness, I got to know him in a roundabout sort of way. He passed down to them his jovial spirit and personality, as well as his love for the circus life. There’s an old Armenian proverb, “Khndzorë tsarits' heru chi ënknum,” or “The apple doesn't fall far from the tree.” His two daughters and grandchildren all followed his footsteps into the traveling life of a circus performer. This summer, they came to Nevada to perform their award-winning balance, limbo, and hand balancing acts for the Saltoriya show. They didn’t know it, but he was there. Most people don’t know that there are many ghosts in the circus, friendly, loving, laughing spirits that appear on stage alongside the live performers. Every night I watched Saltoriya, every birthday party I attended that season, his presence was felt, on and off the stage, right there by his family, his broad smile and impish grin. A lot of circus performers pass down their craft and art to their families, but he passed down a lot more. I first saw his work in the 1963 movie Path to the Arena, a popular comical feature film loosely based upon a fictionalized version life of Yengibarov’s entry to the circus world. While Yengibarov plays a foolish, clumsy and untalented college student who quits school to run away with the circus, Rafael and his brother flawlessly perform a unique dangerous and complicated aerial acrobatic act that I have never seen repeated. Unbeknownst to many, his daughter Anaida steals the limelight for a few seconds, playing the role of a screaming baby in the audience frightened by a wide-mouthed, large-toothed performing hippopotamus in a custom-made pool. Only in the Soviet circus would a hippo find a home. Rafael began performing in the circus in 1952, when he was 23, but ended his career working as a clown and comic actor for 35 years, entertaining audiences with his low wire acts, balancing acts, magic tricks, and even dog training, until 2005. Many knew him as a stuntman. He was named an honored state artist of both Armenia (1967) and the Russian Federation (1994), rare awards that few performers get. I am grateful that he shared his talent and life with us. Even through his photographs and videos, he still makes us laugh and see the circus with fresh eyes. He tickles us, raises our spirits and though he is gone, he will never be forgotten.